Browse through pictures from the old west and you're bound to see a number of paint horses in many of them. Although the breed was brought to North America by Spanish Conquistadors in the 1500's, the horses with the "paint splashes" were plentiful and popular among cowboys and Native Americans alike by the early 1800's. The colorful equines certainly were coveted for their unique markings, but their behavior and personality traits score high, too. Paint horses are known for their trainability, and aptitude for learning new skills and tasks quickly. Pet MD characterizes paints as having an innate intelligence that makes them ideal candidates to train for competitions. Paint horses are regular participants in all types of events, including time-honored western stock-horse contests in addition to other riding competitions, like hunt-seat and dressage. 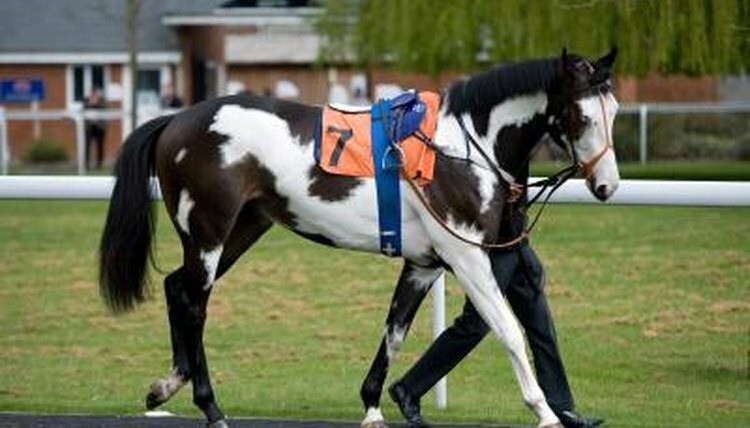 For an easygoing, good natured horse, you can't beat the paint breed. Friendly, sociable and gentle -- these behavior characteristics reveal why paint horses are popular picks as trail horses for long distances as well as short pleasure rides. It takes more than brains to be successful in the competition ring, and the paint horses' work ethic is one more reason why the breed is chosen commonly to compete in events. Paint horses have a willingness to run repeatedly through a course or execute other tasks, giving it their all and displaying impressive endurance even when they're tired. Brains, good nature, hard worker -- any of these characteristics might persuade you to choose a paint horse over another breed. However, if those qualities aren't enough, the paint horse's eagerness to please certainly would tip the scales in his favor. In their 2011 book "Horses for Dummies," Audrey Pavia and Janice Posinkoff, D.V.M. confirm that the breed, so often chosen as a model competitor for events, makes an excellent companion outside the ring, too.